It is not quite official but it looks like systemd is coming to Debian and after reading some of the heated mailing list discussion on that decision, I am curious about the polarizing nature of systemd among linux users. I run Debian (sysvinit) and Gentoo (OpenRC) systems and know nothing concrete about systemd, though it looks like it is coming my way. I have seen this related question asking the pros and cons of systemd vs upstart, but it has been 3 years since that question was posted and I'm sure things have changed in that time. My question is: How does systemd compare to other init systems? What sets it apart -- what can it do that the other init systems cannot? Is there anything to lose in switching to it from another init system? How does administering systemd compare to the others? Probably everything you want to know is here on the "Debate Init System To Use" pages that the Debian project put together around making the decision of which initsystem to go with. Within that page is a separate link to each of the choices of initsystems. For a primer on Systemd this page has pretty much everything one would need to know to get started with it, RHEL7: How to get started with Systemd. Q#1: How does systemd compare to other init systems? This is a very tough question to address in the space of an SE answer so I'd rather defer to the various sources that I've referenced above. I'll say this though. In reading through much of the articles about systemd of the alternatives it's trying to address many aspects of what were deficient in previous tools used for starting up services on Linux systems. It has a very well thought out design and is attempting to provide it in a very modular way. So IMO, I would say that it compares very favorably both in terms of the effort in its design, execution of that design, and the adoption of it by several larger Linux distros. Q#2: What sets it apart -- what can it do that the other init systems cannot? On the logging front, systemd has instituted a new logging system called the "Journal", the service is called systemd-journald.service. This is its own topic, you can read more about it here in this article titled: Introducing the Journal. Here's an example of a user, "harald", logging in. systemd uses a novel approach here of using cgroups to both contain and resource limit any services that require forking or limiting of access to resources. Q#3: Is there anything to lose in switching to it from another init system? Probably the biggest caveat to switching to systemd over Upstart or sysV init is having to embrace a lot of new complexities. 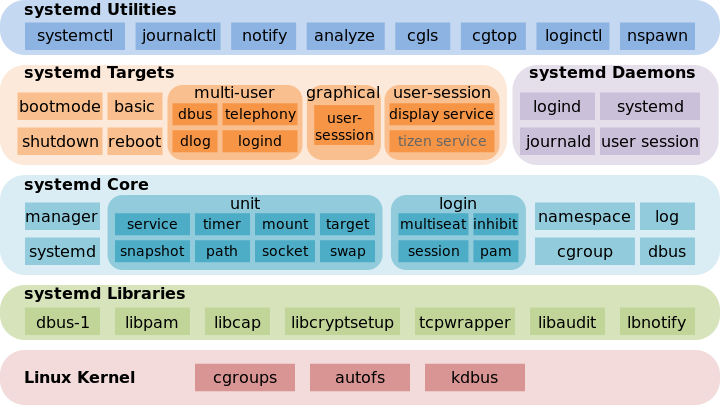 Systemd has a lot of moving parts and is extremely feature rich and with that added capabilities you'll likely be spending a fair amount of time gaining understandings around how it all works. Q#4: How does administering systemd compare to the others? As stated in my above answer to Q#3. I'l reiterate here again. Where sysV init was fairly trivial to learn how to manage and navigate in a few hours to days, Upstart will likely take you a week or more to get up to speed, while systemd will likely take you much longer, I'm anticipating taking several weeks to gain enough cursory knowledge about it, where I'll be able to both produce my own .service files, to stopping/starting services with the same ease that I now enjoy with sysV init. Not the answer you're looking for? Browse other questions tagged systemd init-script or ask your own question. How to debug systemd “init” freeze during boot? What are ways of creating a daemon using systemd?